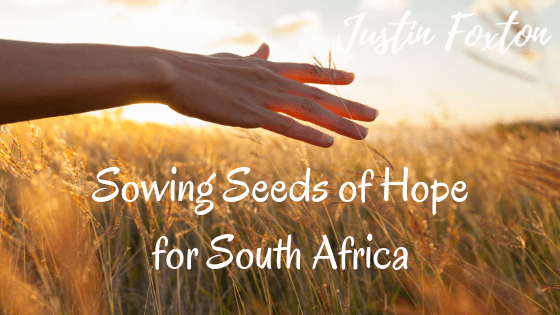 Sowing Seeds of Hope for South Africa – and a welcome pat on the back! What a joy it always is to receive my weekly attitude adjustment from my friend and colleague Steuart Pennington – the founder and CEO of the website South Africa the Good News (www.sagoodnews.co.za). It comes in the form of his newsletter that always strikes a necessary balance between acknowledging the myriad challenges we face as a country, whilst articulating the many positives. It is a great tonic for the soul! It gave some uplifting stats: That real GDP per capita has increased by over 30% since 1994; University Enrolment has risen from 211,000 students in 1985 to 825,000 in 2015 – a growth of 289%. South Africa has 11 universities ranked in the top 4% of universities worldwide. And life expectancy has increased by 10 years since 2002. There is much more – and you should visit the website and register for this newsletter – especially if you are feeling a little ‘dikbek’ about the state of the nation. But I am not writing this simply to regurgitate the content of this specific newsletter. Whilst reading it, I became deeply grateful for how tirelessly Steuart (and indeed some others) has devoted himself and his organisation to balancing the narrative in our country. We have so many committed to exposing the bad news, but so few who devote themselves to spreading the good. And we desperately need both for accountability to be driven on the one hand, but for hope to remain kindled on the other. For without hope, we lose the will to keep contributing to the South Africa we all believe in. Steuart is a true dealer in hope – and I admire him for never allowing himself to be distracted or deterred. There are certainly others out there doing this incredible work. One of them is Brent Lindeque the founder of www.goodthingsguy.com. These people have a remarkable ability to see hope where others see none. They have a way of making us feel like we can make a difference, one small positive thought or action at a time. In the face of huge criticism and accusations of being Pollyanna’s or ‘sunshine journalists’ – they just keep exposing the good; actively looking for reasons to celebrate life in South Africa. One thing that I can assure you is that your life here in South Africa will be happier and more hopeful if you get a good dose of the medicine that guys like Brent and Steuart dish up. Go to their websites, sign up and support what they are doing. I salute you gents. 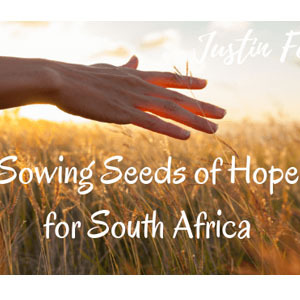 Keep sowing our fields with seeds of hope and all will be well in this marvellous place.